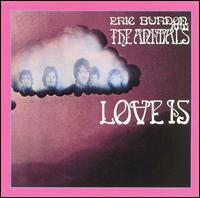 Love Is is the third album by Eric Burdon and The Animals. It was released in 1968 as a double album. Love Is was issued in both the United Kingdom and United States. It was the last album released before The Animals' second dissolution in 1968. An edited version of the track "Ring of Fire" was released as a single and peaked at No. 35 in the UK pop charts, breaking the top 40 in Germany, Holland, and Australia as well. Aside from the self-penned "I'm Dying (or am I? )", the album consists entirely of cover songs with extended arrangements by the Animals and sometimes even additional lyrics and musical sections. The entire Side D is occupied by a medley of songs originally by Dantalian's Chariot, a former group of band members Zoot Money and Andy Summers. Dantalian's Chariot archivists have been unable to locate a recording of "Gemini", and it is possible that Eric Burdon and the Animals were the first to actually record the song. This album captured the only studio work of guitarist Andy Summers with the group. The recording of Traffic's "Colored Rain" includes a guitar solo by Summers which runs a full 4 minutes and 15 seconds. To ensure he ended at the right place, Zoot Money kept count throughout the solo and gave him the cue out at bar 189.
brass? arranger? female vocalist on "To Love Somebody" ?? ^ The Animals chart entries, tsort.info. ^ Dantalian's Chariot: Chariot Rising sleeve notes. ^ Andy Summers, One Train Later, Thomas Dunne Books, 2006. ISBN 0-312-35914-4. This page was last edited on 24 October 2018, at 14:33 (UTC).